The response to last year’s crises in Haiti, Chile and Pakistan revealed an exciting potential. Volunteers from thousands of miles away could possibly play an important role in humanitarian operations by using social networking platforms and free, open source software to create live crisis maps. 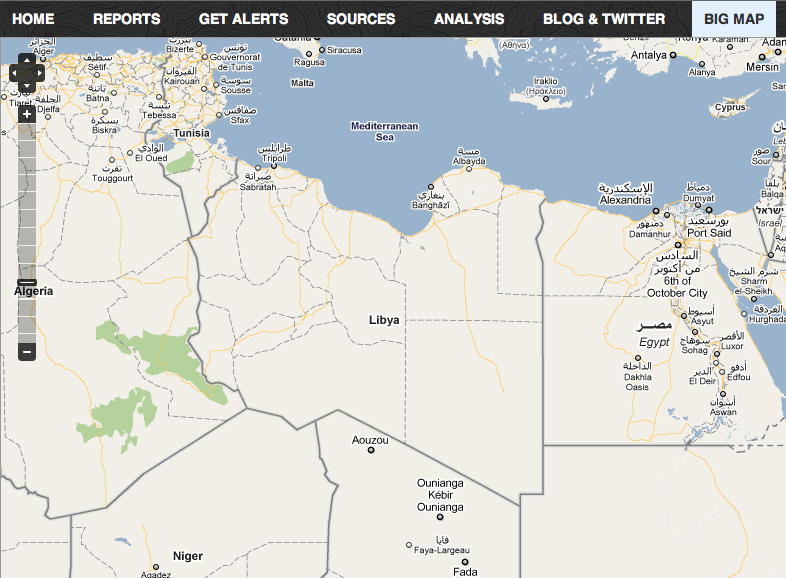 Today’s volunteer efforts on the Libya Crisis Map are turning that potential into reality. When I called Ushahidi’s David Kobia to launch the Haiti Crisis Map just hours after the earthquake that struck Port-au-Prince, that was purely an emotional reaction. I had no plan. I just needed to do something because watching the first reports coming in on CNN was agonizing and unbearable. Some of my closest friends from The Fletcher School were in Haiti at the time and I had no idea whether they were still alive. Little did I know that several hundred volunteers from dozens of countries would soon join the efforts to create a live crisis map of the disaster-struck country. I called David again a few weeks later just hours after another earthquake had struck, this time Chile. Unlike Haiti, I now had a better sense of what it would take to launch a crisis map, but I had no idea who might volunteer to keep this map alive around the clock since volunteers working on Haiti were either over-stretched or burnt out, or both (like I was). As luck would have it, I was due to give a talk at Columbia University that same day on our experience in Haiti. So I used my speaking slot to recruit volunteers for Chile. Several came up to me after the presentation and some sixty new volunteers were trained within 48 hours. This is how the Chile Crisis Map got started. Pakistan was different. I didn’t launch a crisis map; someone else did, and from Karachi. But he needed volunteer support to create the Pakistan Crisis Map so we turned to the incredible volunteers who had helped out in Haiti and Chile and recruited new ones along the way. By now, we had a core set of volunteers with an impressive track record in live crisis mapping. This is when I realized what the next logical step was. To give these volunteers a name and visibility. We needed to give them the opportunity to share what they had learned and train new recruits. Thus was born the Standby Volunteer Task Force: an online community for live mapping. We got to work right away after launching in October 2010. Our first step was to create protocols and establish workflows in order to streamline crisis mapping processes and render them as efficient and effective as possible. We had the opportunity to test our first drafts thanks to the UN OCHA Colombia team who invited us to participate in an official earthquake disaster simulation exercise just weeks after we launched. This provided us with invaluable feedback which we used to revise our protocols. In January of this year, we activated the Task Force to provide live mapping support to monitor the referendum in Southern Sudan. We also learned a lot from that experience and improved our workflows accordingly. Last month, New Zealand was struck by a powerful earthquake so we activated the Task Force at the request of local disaster response colleagues. Again, there were some important lessons gained from that deployment, and again we went back to our protocols and workflows to improve them further. This week, the Information Services Section of OCHA in Geneva requested that the Task Force be activated for Libya. This was a first. 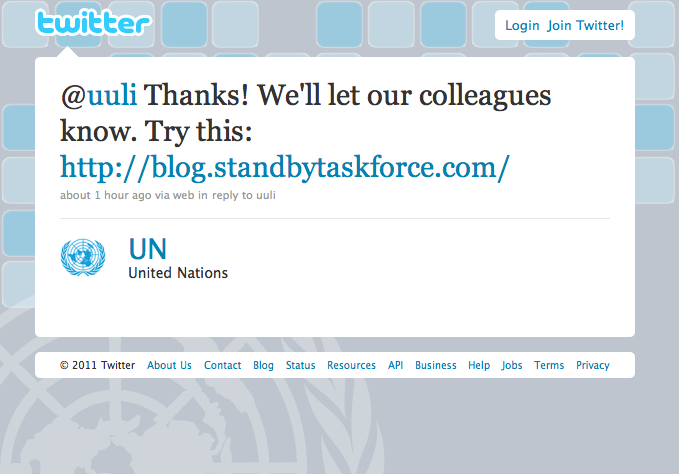 Unlike Haiti, we had a direct channel from day one to the main coordinating body of the UN for humanitarian assistance. We also had a trained network of volunteers on standby with protocols and workflows that had already been revised and tested several times over almost half-a-year. It is also important to emphasize that many Task Force volunteers are skilled professionals, including humanitarian professionals. This is a self-selected group and while many new volunteers who join may have little experience in crisis mapping, they go through a structured training process managed by the most experienced volunteers on the team. The result? 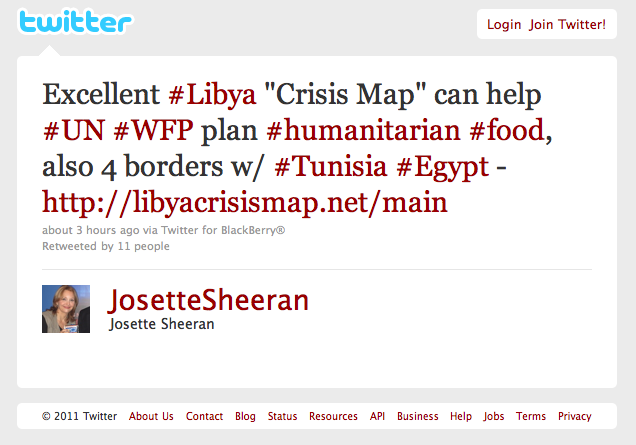 A Crisis Map of Libya launched within hours and public institutional support expressed within days. Some of the awesome volunteers crisis mapping Libya brought their experience from the Haiti, Chile and Pakistan days. Most however, are newly trained and bring renewed energy, dedication and good cheer to the Task Force. The public tweets below are amazing and unprecedented in so many ways! Thank you UN and Josette, we really appreciate your public support! 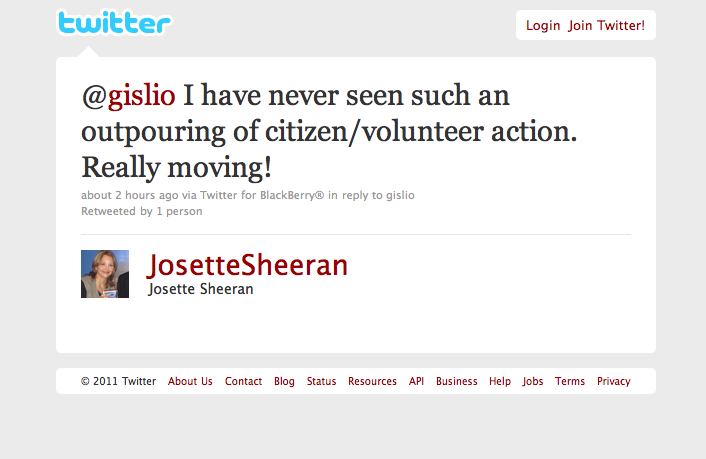 Note that Josette Sheeran is the Executive Director of WFP. The first is a reminder that being human is about helping others in need. And thanks to today’s easy mapping platforms, volunteers can help respond to a crisis from thousands of miles away by collaborating online to create a live map that can be used to support humanitarian operations. They can use social networking platforms to connect, organize, recruit and train. There’s so much we as volunteers can do online to help, especially if we’re prepared and are ready to work hard. This is why I think it’s time for established volunteer networks like UN Volunteers (UNVs) to offer both field-based and web-based opportunities. Why not train UNVs in online crisis mapping so they can be activated to directly support UN operations via web? The second powerful narrative for me is the collaboration between large established organizations and new decentralized volunteer networks. OCHA took a bold move when they decided to bet on the Volunteer Task Force for the Libya Crisis Map. They should be applauded. They’ve never done this before and neither have we (vis-a-vis direct collaboration with a UN office during a major crisis). I find this unprecedented move a powerful indication that learning by doing is almost always better than learning by just talking. This impromptu collaboration also shows that large organizations and small volunteer networks can work together in a way that creates more added value than flying solo does. It’s the beginning of a new world for humanitarian response; The Prologue, if you will. I’m excited for what comes next. I know there’s a lot to figure out and many obstacles to overcome. I have no illusions of that. But I’m hopeful; as ready as I’ll ever be; and I have the honor and privilege to work with and learn from the best volunteer network of crisis mappers on the planet. They are the true heros, for without them the map would be barren. Onwards. 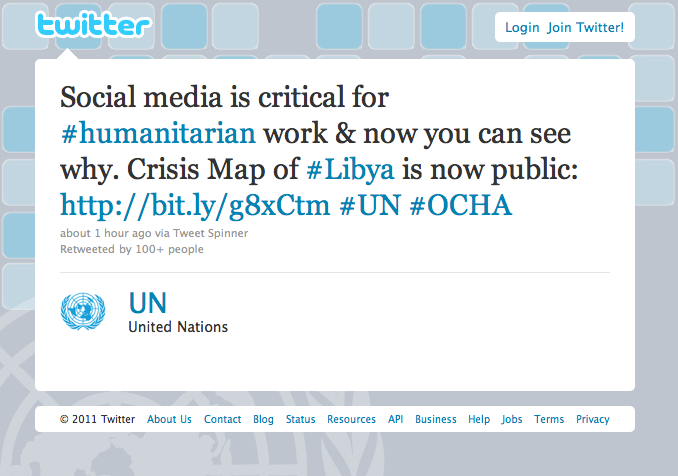 This entry was posted in Crisis Mapping, Crowdsourcing, Social Media and tagged Libya, OCHA, TaskForce. Bookmark the permalink. It has been a true honor to be part of this effort and to see the wonderful spirit of the fantastic volunteers which are the ones doing all the great work. And I look forward to work with this great team to bring things forward, not in small steps but in the giant leaps we are used to taking in the crisis mapping community. To those who said it couldn’t be done our answer is YOU AIN’T SEEN NOTHING YET!!!! Thanks for all your help, Gisli! I couldn’t agree more. Though not exactly what you are talking about, I have worked with UN-Habitat to both train and support volunteers for mapping programs. Specifically one of the local bright stars on the MapKibera team, Jane Bisanju, was trained in the “non-tech” of end of mapping through programs supported by UN-Habitat, and thus was able to work and support that team. As well, UN-Habitat’s Urban Youth Fund is currently supporting MapKibera. I know that UN-Habitat is keen on engaging mapping, specifically in longterm post disaster reconstruction. But as well know, UN agencies sometimes move slowly. Perhaps some form of proposal going forward might help. Great post. I think that we have made great progress (especially from the UN-OCHA side) in this emergency. I believe that this is a great first step of hopefully many to follow. I can see that we have room for great changes – let’s make them happen! I am sorry that I missed it in our conversation yesterday, but UNV does already have a program for online volunteering (http://www.onlinevolunteering.org/en/vol/index.html). Perhaps we can approach them now to see if we can get them involved in this emergency? Thanks to you, the Standby Task Force, and many others (e.g. Ushahidi development team who are making rapid changes). Thanks Andrej! Just to let everyone else know, I’m following up with Andrej and getting in touch with UNV to pursue this further. Thank you for providing those of us who are online volunteers the opportunity to help in crises around the world. Like you, my desire to do something to help the people of Haiti in January ’10 brought me to this work and while looking for a way to help I “met” the founders of Humanity Road through Twitter. The experience has been wonderful and it has been a true learning experience for me. I am grateful that our volunteers from Humanity Road are a part of your work. The tools available and the online skills of volunteers from around the world are, in my opinion, the future for prompt and efficient crisis management and response. Thanks for your help, Bettie! This is certainly a group effort and I’m incredibly impressed that we’re coming together as one team. I’m incredibly impressed by this whole experience. In Patrick’s words, “the task force is a platform..not an organization”. in this it serves as a place for many organizations to join in a collaboration. Humanity Road volunteers work side by side with NetHope, Konpa Group, Crisis Commons, Crisismappers and NGO’s. This promotes volunteerism and unity across many skillsets in a non-competititve environment to help present a common operating picture. – to Infinity and beyond! •Supporting community planning and development. •Strengthening local capacity by adopting and using information technology. •Supporting health and education related activities. They’ve been mobilizing volunteer mappers during crisis since 2003.